Supported Purvottanasana: This pose looks and feels very relaxing. It is also has a powerfully restorative effect on the nerves, on the heart and on the immune system. Adho Mukha Svanasana: To help draw the weight away from the arms and shouldres and back toward the legs and hips, raise each foot up separately and place it down on the back of the ball of the foot. Extend the skin on the sole of the foot back, and press the heels down. Sirsasana: If you have been practicing this pose close to the wall for longer than 6 months, its probably time you moved away from the wall. Measure the length of your shin – thats how far away you should be from the wall. Now you are head standing, not head leaning! Eka Pada Bekasana: lengthen along the entire left side of the body, from the left knee to the left breast. 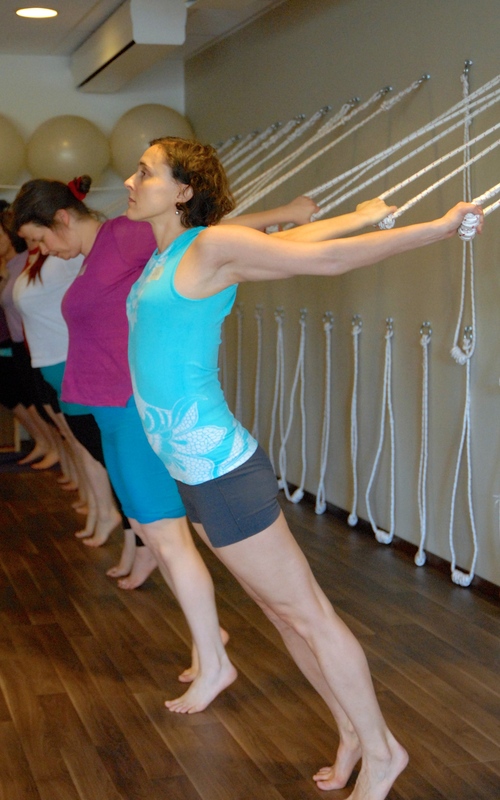 Rope 1: lift your back ribs as well as your front ribs!